IPL 2018: After two years of suspension, Men in Yellow are back to the Indian Premier League. Chennai Super Kings is one of the most successful IPL team so far, as they won IPL and Champions league T20 twice. All-time CSK favourite players like M.S. Dhoni, Suresh Raina and Ravindra Jadeja are in the lineup except, Ashwin. Also, the owners spend cash as well in the auctions by bagged good players to the team. CSK’s biggest trademark name could be M.S. Dhoni, who will continue his IPL career as Captain of CSK. The fans are eagerly waiting to see him on Yellow jersey and also in the captaincy role once again. He has won all possible cups for the team India and CSK such as ICC World T20, ICC Cricket World Cup, ICC Champions Trophy, the IPL Trophy or the Champions League T20. The 11th edition, IPL 2018 will be played at nine venues by spending 51 days with eight teams. Each team have at least their one home ground except Kings XI Punjab, they will play three home matches in Indore and four other matches at home in Mohali. On 7th April 2018 (Saturday) MI vs CSK at Wankhede Stadium, Mumbai at 08:00 pm IST. On 10th April 2018 (Tuesday) CSK vs KKR at M. A. Chidambaram Stadium, Chennai at 08:00 pm IST. On 15th April 2018 (Sunday) KXIP vs CSK at Holkar Cricket Stadium, Indore at 08:00 pm IST. On 20th April 2018 (Friday) CSK vs RR at M. A. Chidambaram Stadium, Chennai at 08:00 pm IST. On 22nd April 2018 (Sunday) SRH vs CSK at Rajiv Gandhi Intl. Cricket Stadium, Hyderabad at 04:00 pm IST. On 25th April 2018 (Wednesday) RCB vs CSK at M. Chinnaswamy Stadium, Bengaluru at 08:00 pm IST. On 28th April 2018 (Saturday) CSK vs MI at M. A. Chidambaram Stadium, Chennai at 08:00 pm IST. On 30th April 2018 (Monday) CSK vs DD at M. A. Chidambaram Stadium, Chennai at 08:00 pm IST. On 3rd May 2018 (Thursday) KKR vs CSK at Eden Gardens, Kolkata at 08:00 pm IST. On 5th May 2018 (Saturday) CSK vs RCB at M. A. Chidambaram Stadium, Chennai at 4:00 pm IST. On 11th May 2018 (Friday) RR vs CSK at Sawai Mansingh Stadium, Jaipur at 08:00 pm IST. On 13th May 2018 (Sunday) CSK vs SRH at M. A. Chidambaram Stadium, Chennai at 08:00 pm IST. On 18th May 2018 (Friday) DD vs CSK at Feroz Shah Kotla Ground, Delhi at 08:00 pm IST. 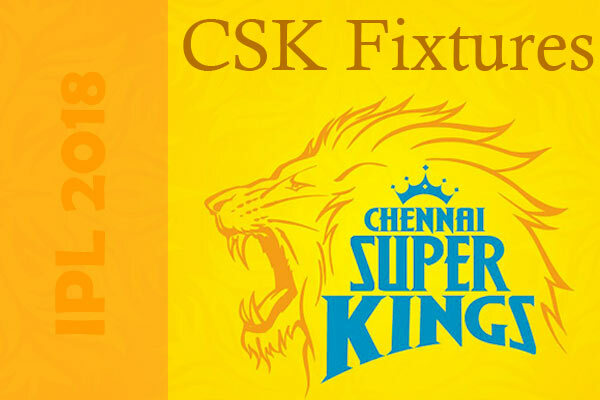 On 20th May 2018 (Sunday) CSK vs KXIP at M. A. Chidambaram Stadium, Chennai at 08:00 pm IST. Star India Pvt. Ltd had the official rights for live broadcast and live stream online. So, check Star Sports TV channels to watch Indian Super league matches. For CSK fans, Star Sports 1 Tamil will also broadcast all the matches.